Can Pool Chlorine Damage My Eyes/Vision? Opening your eyes underwater in the pool is always tempting, especially on a sunny day when the water is crystal clear and oh, so refreshing. But considering that all of that clarity is actually coming from regular cocktail of chlorine treatments, should you really open your eyes underwater and expose them to all of those chemicals? The short answer is sure – it’s probably okay! But the long answer is, well, it kind of depends. You see, there’s a sweet spot for eye-safe chlorination. Between the recommended levels of 1.5-2.5 ppm for free chlorine residual, unstabilized or 2.0-2.5 ppm for stabilized, chlorine is an excellent eliminator of both bacteria and algae by methods of disinfection and oxidation – and is also considered safe for your eyes. So in a clean, adequately chlorinated pool, you should generally be able to swim with your eyes open without having a reaction or causing harm to your vision. Of course, some people with more sensitive eyes might get eye irritations even at the recommended levels of chlorination, but many more people will experience eye irritation if chlorine levels are elevated. Typical mild irritations from normal chlorine levels include redness and can be treated with artificial tears and cool compresses. This is no big deal. Moderate irritations may include a scratchy sensation while blinking and some burning while the eyes are open. This certainly isn’t comfortable, but it’s also treated with a bit of TLC. If you have a more intense reaction though, you may need to seek medical care. If you think you’ve exposed your eyes to unsafe chlorine levels, flush them copiously with water or an eye rinse for several minutes before seeking medical care immediately as you would do if you had any foreign chemical in your eye. What About Swimming in Fresh Water? Avoiding chlorine doesn’t mean avoiding trouble when swimming underwater with open eyes. If you swim in water that is not chlorine-treated, like a river or a lake, keep in mind that you’re actually at a greater risk for developing an eye infection. This is because underwater, the natural tear film that normally protects your cornea from bacteria gets washed away, which leaves your eye exposed to all of the dirt and bacteria that might be in the water. 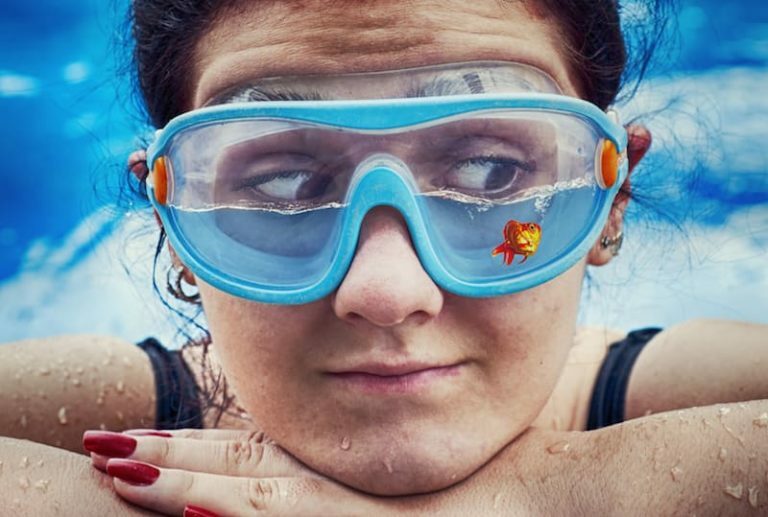 Ultimately, wearing goggles is the best way to protect your eyes from chlorine and bacteria in the pool or in any body of water, but if you don’t have a pair and you’re sweating for a swim, rest assured that at recommended levels, chlorine is considered safe for your eyes. That being said, Dr. Ryczek still does not condone cheating during Marco Polo!